This is an sale for (1) authentic, obsolete 5 Limited 777 Casino Chip made by the RIVIERA Hotel Casino, Las Vegas, NV for The VILLAGE PEOPLE in concert April 20-21 2001. The VILLAGE PEOPLE is a concept Disco Group formed in the USA 1977, well known for their on-stage costumes depicting American cultural stereotypes, as well as their catchy tunes and suggestive lyrics. 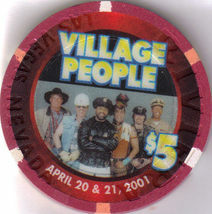 Original members were: Victor Willis ( the Police Officer character), Felipe Rose (The Native American), Randy Jones (the Cowboy), Glenn Hughes (the Biker) David Hodo (the Construction Worker) Alex Briley (the G.I.). Originally created to target disco's gay audience by featuring popular gay fantasy personas, the band's popularity quickly brought them into mainstream. Chip measures 1-1/2" in diameter, Used/Circulated Send email if you need additional details about this chip. Buyer is responsible for 3.95 for postage and handling within the USA. International shipping rates apply. Shipping always combined on multiple purchases. 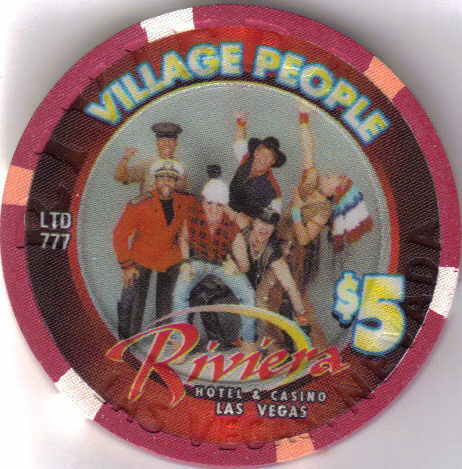 Do check my store forlots more Las Vegas Collectibles often! Thanks for stopping by!